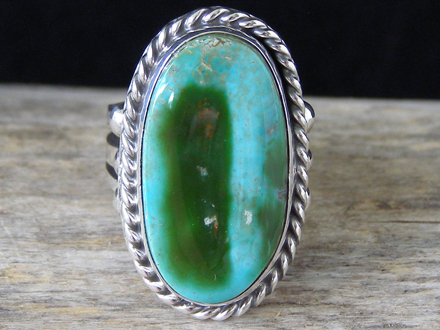 This is one of Navajo silversmith Linda Yazzie's simple, classic rings made with a natural, untreated stone of Royston turquoise set in a smooth bezel wrapped with twist wire and three raindrops on each side framing the stone. The shank is split into three narrower bands before attaching to the ring back. The pricing is based on the carat weight and cost of the turquoise. Hallmarked LY and stamped Sterling inside the shank.